Whenever I tell people I do candy experiments, they assume the same thing: that I whip up delicious candy recipes in my kitchen. "Um, no," we tell them. "We destroy it for the sake of science." 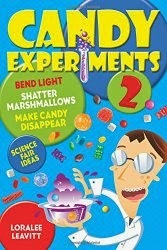 But what's wrong with making candy for the sake of science? Nothing at all. When my husband told me that the filling of cordial cherries starts out solid, I practically called him a liar. "There's no way," I said. "They must freeze the cordials or something before they dip them. How could they start solid and turn liquid?" But he was right (as usual). The standard way to make cherry cordials is to first make a dough or fondant of butter and powdered sugar, wrap each cherry in the dough, and then dip the whole into chocolate. So how does it get that lovely liquid filling? A secret ingredient: invertase. Invertase is an enzyme that breaks crystalline sucrose (regular table sugar) into fructose and glucose (as found in corn syrup). The fructose and glucose don't fit together into crystal form. This causes the dough to liquify, producing a soft center. I followed this about.com recipe to make my cherries. Being impatient, I didn't dry the cherries overnight, and I think the extra moisture trapped inside my cherries probably helped soften the centers. I also learned that the invertase reaction doesn't happen overnight. In fact, my fear of putting the dough in the fridge overnight (would it deteriorate into a liquid mess?) that caused me to stay up till 2:30 am finishing the project was unfounded. These cherries take weeks to soften, and mine have never really liquefied. But they still taste incredible!